In Singapore, Apple Pay works on any transit method supporting Mastercard. Visa compatibility should come in the second half of 2019, TransitLink said. The New York City pilot will initially be limited to a couple of lines, expanding throughout the rest of the year, according to TechCrunch. 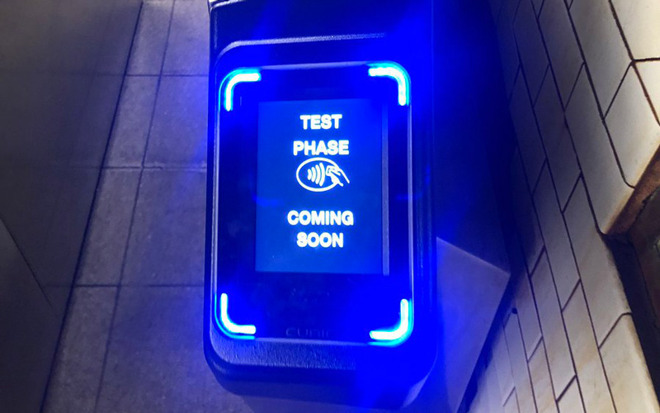 Some subway riders are already seeing "coming soon" messages for wireless payments at subway turnstiles. In Chicago and Portland, where Apple Pay is already accepted for transit, people will soon be able to add preloaded Ventra and Hop cards to the iOS Wallet app. The change was reported by the Chicago Tribune and Willamette Week — a blog, Ata Distance, further suggested that both cards will support Express Transit, optionally bypassing the need to use Touch ID, Face ID, or a passcode. The Chicago and Portand additions were first spotted by MacRumors. That technology has so far been limited to transit networks in China and Japan. A similar Express feature is available for iOS student cards at universities like Duke and Johns Hopkins.